Cougar Mountain is a large area of land between Eastgate and the Cougar Mountain Regional Wildland Park featuring several residential neighborhoods. Cougar Mountain homes for sale are often brand new, mansion-style or large, upscale single family residences. The area is conveniently located off I-90 south of Bellevue and Redmond and northwest of Issaquah. The Wildland Park itself is over 3,100 acres of caves, waterfalls, and nearly 40 miles of trails popular with hikers and horseback riders. It is also home to the Cougar Mountain Zoo. 3 Beds | 2.75 Baths | 2470 sq. Ft.
5 Beds | 4.25 Baths | 6170 sq. Ft.
7 Beds | 5.5 Baths | 5761 sq. Ft.
4 Beds | 3.5 Baths | 3250 sq. Ft.
5 Beds | 5 Baths | 7240 sq. Ft.
5 Beds | 5.5 Baths | 5927 sq. Ft.
Blue Summit Realty has the most accurate and up to date Cougar Mountain real estate listings on the web. Currently there are 6 homes for sale, and 8 vacant land properties in Cougar Mountain. Of the 14 total Cougar Mountain residential listings for sale 0 are bank owned, 0 are short sales, 0 are new construction, and 0 are townhomes. The price ranges from $745,000 to $0 with a median list price of $1,866,649 and median sold price of $1,426,236. Make sure to refine your Cougar Mountain real estate search by property type, price, square footage, bedrooms, bathrooms and more with the search tool above or view the Cougar Mountain listings on our interactive map. 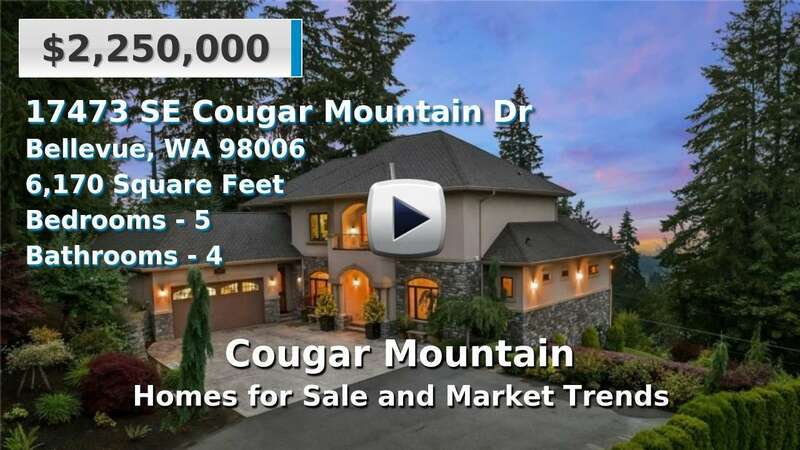 Our Cougar Mountain real estate listings were updated 1 minutes ago.